WE PRODUCE ADJUSTABLE TAP FOR 1/4" TO 2"
Made from S.G. Iron, jaws made from carbon steel heat treated. - High quality tool for Hand tapping operations. Hardened and Tempered Jaws. Smaller sizes available in die Cast or drop forged design. Larger sizes above 1aavailable in steel casting. 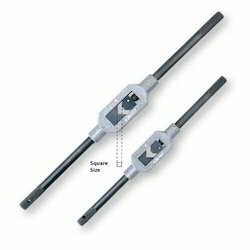 We are a leading supplier of Adjustable Tap Wrench. Size: 1/4", 1/2", 3/4", 1"
Zinc die casted body with hardened steel jaws. Chrome plated knurled steel handle provided with cross hole at one end. We are well-known firm of Adjustable Tap And Reamer Wrenches. In addition, quality experts also check the quality of this product on varied industry standards. Besides, we offer this product at nominal costs. 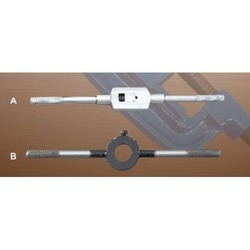 This Adjustable Tap Wrench is a type of hand tool that is used to turn taps on.